Treatment For Diabetic Retinopathy: What Are Available And How They Work? The best treatment for diabetic retinopathy is to prevent it. Currently, there is no effective cure for diabetic retinopathy. Our current medical technology isn’t capable of curing diabetic retinopathy nor restoring normal vision completely. However, it may help slow the progression of vision loss. Without control and treatment, diabetic retinopathy progresses steadily from minimal to severe stages. Treatment for diabetic retinopathy depends largely on the type and severity of the diabetic retinopathy that you have. For most cases of early diabetic retinopathy (nonproliferative diabetic retinopathy), you may not need any immediate treatment. However, it is crucial that you get your eye examined at least yearly to monitor your condition. Diseases that are treated at early stages are often easier to be contained or cured. For more advanced stages of diabetic retinopathy, you will be referred for more detailed assessment and treatment may be recommended. Treatment for diabetic retinopathy can be categorized into two areas. Laser and non-laser treatments. Laser surgery is usually performed in an office setting. 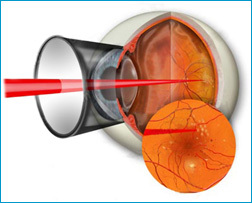 High heat from the laser beam is used to burn and seal off bleeding of the blood vessels in the eye. During the procedure, an anesthetic eye drop is applied to numb the surface of your eye. If the disease advances, leakage of fluid from blood vessels can lead to swelling of the macula (macular edema), the most common form of vision loss for diabetic patients. Photocoagulation is used to create small burns on the leaking blood vessels near the macula to reduce fluid leakage. The main goal of this treatment is to prevent further vision loss by reducing the swelling of macula. It is rare that people can recover normal vision, although some may experience partial improvement. During the procedure, more than a thousand tiny spots of laser energy are applied to surrounding areas of the retina, leaving the central area and macula untouched. This laser treatment is used to shrink abnormal blood vessels that form from neovascularization. The laser burns prevent the abnormal blood vessels from growing in the future and also decreases the chance that vitreous bleeding. Panretinal laser has proven to be very effective for preventing severe vision loss from vitreous hemorrhage and traction retinal detachment. In some cases of proliferative diabetic retinopathy, vitreous hemorrhage prevents the ophthalmologist from performing the laser treatment as the blood blocks the laser beam. In such cases, the doctor may recommend vitrectomy first then accompanied with laser treatment. Due to its complexity, this operation has to be carried out in a hospital or surgery center. After anesthesia is administered, doctor proceeds to make a tiny incision in your eye. Delicate instruments are then used to remove the scar tissues and blood in the eye. The vitreous gel is replaced with solution or gas to help give the eyeball’s shape and holds the retina in place. It is important to note that laser treatment does not cure diabetic retinopathy and sometimes vision cannot be recovered. This type of treatment for diabetic retinopathy is meant to prevent further vision loss. After the treatment, usually no hospitalization needed. Vision may be blurred at first but patient usually recover after several hours. Your eyes may be more sensitive to light therefore you may need sunglasses until your eyes adjusted. Sometime medication may be used in treating diabetic retinopathy. For instance, steroids can be useful in reducing fluids that accumulate in the retina when injected directly. However, this type of treatment commonly causes steroid-induced cataracts and steroid-induced glaucoma. In other cases, you may be given an anti-VEGF medication. 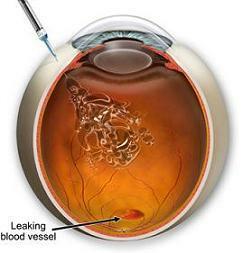 Intravitreal anti-VEGF injections are often used to treat age-related macular degeneration. However, recent research has shown that they might be useful in treating diabetic retinopathy too. This medication blocks a substance known as vascular endothelial growth factor ( VEGF) which contributes to abnormal blood vessel growth in the eye. After your is numbed with anesthesia, the medication is injected into the vitreous gel. At the end of the injection, the pressure in your eye will be measured. The pressure may increase after the treatment. If it reminds high, you may need further treatment. The long-term effectiveness of intravitreal anti-VEGF injections is unknown because they are still new in the field of treating diabetic retinopathy.